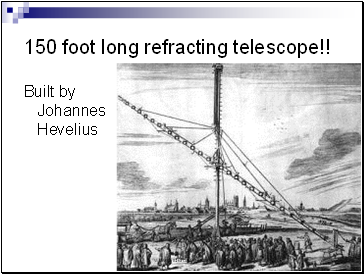 150 foot long refracting telescope!! 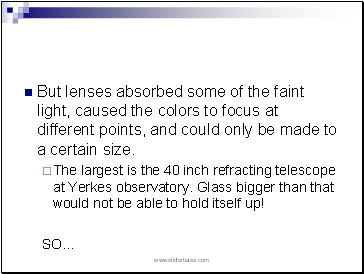 But lenses absorbed some of the faint light, caused the colors to focus at different points, and could only be made to a certain size. 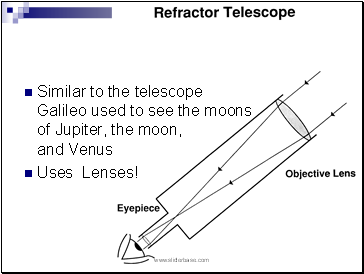 The largest is the 40 inch refracting telescope at Yerkes observatory. Glass bigger than that would not be able to hold itself up! 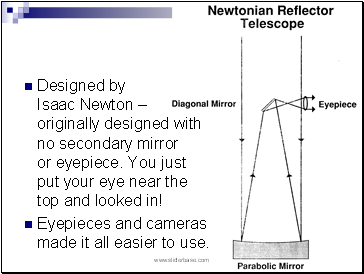 Designed by Isaac Newton – originally designed with no secondary mirror or eyepiece. You just put your eye near the top and looked in! 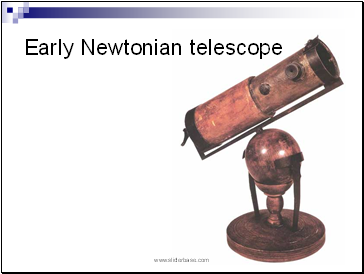 Eyepieces and cameras made it all easier to use. 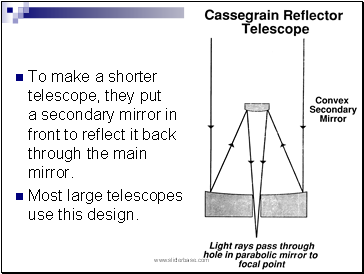 You could make a glass mirror a LOT bigger than 40 inches – and it didn’t distort the light. 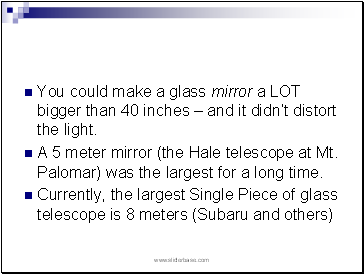 A 5 meter mirror (the Hale telescope at Mt. Palomar) was the largest for a long time. 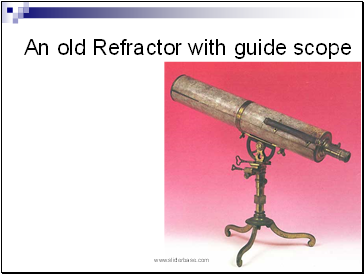 People were still unsatisfied – and came up with the idea of putting together a number of carefully made mirror segments, controlled by computer to stay extremely accurate. 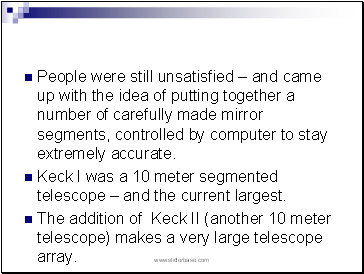 Keck I was a 10 meter segmented telescope – and the current largest. 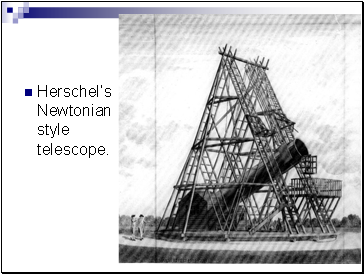 The addition of Keck II (another 10 meter telescope) makes a very large telescope array. The deeper the curve, the closer in the focal point. 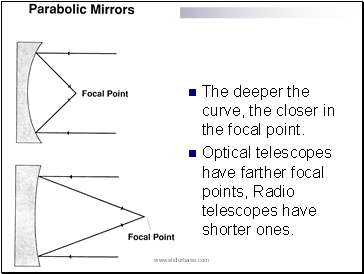 Optical telescopes have farther focal points, Radio telescopes have shorter ones. 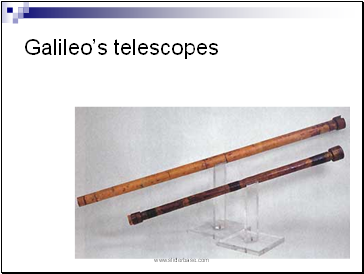 To make a shorter telescope, they put a secondary mirror in front to reflect it back through the main mirror. 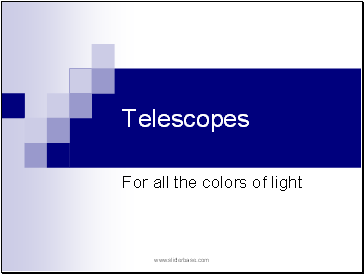 Most large telescopes use this design.